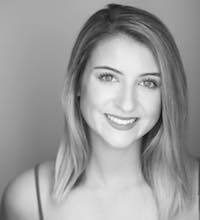 Erica is a graduate of Point Park University with a Bachelor of Arts in Musical Theatre. She has traveled the US and parts of Canada with the National Tour of Pippin (Fastrada) in 2016-2017 and the tour of Dirty Dancing: The Classic Story on Stage (Marjorie Houseman) in 2017-2018. Erica is originally from Philadelphia, PA where she grew up dancing and singing in her mom’s studios. She has attended many programs in the arts such as Joffrey Summer Dance, Interlochen Center for the Arts, and Manhattan School of Music’s Pre-College Program. She has taught music and dance to all ages and absolutely loves working with students and seeing their growth.